I like this sconce (with the plain white shade) from Schoolhouse Electric but am wondering if there might be others available that are more affordable and/or that I might like even more. When I search for "porcelain sconce" I mostly seem to turn up sconces that stick way out from the wall and look like they're made to go above a doorway or sink. Are there better search terms I could use to find sconces in this style, or do you know of other specific sconces that might meet my criteria? I'd also be interested in fixtures that are chrome rather than porcelain but meet the other requirements. I'm aware of Rejuvenation and Schoolhouse but am wondering if there might be a more downmarket supplier with a similar offering, or even a similar fancy vendor with more sconce options. I don't know that they have anything in this style, but all of the stuff I've gotten from Hubbarton Forge has been great. For sources, I've gotten stuff from Lighting Universe and Seattle Lighting before. Both have huge catalogs online. The prices on the ones you posted seem quite low to me, so I'm not sure you'll find anything cheaper, but I could be wrong. I will say, for the price, Schoolhouse Electric is very nice quality and, I believe, all made in the U.S. I've had luck finding period correct fixtures on ebay. 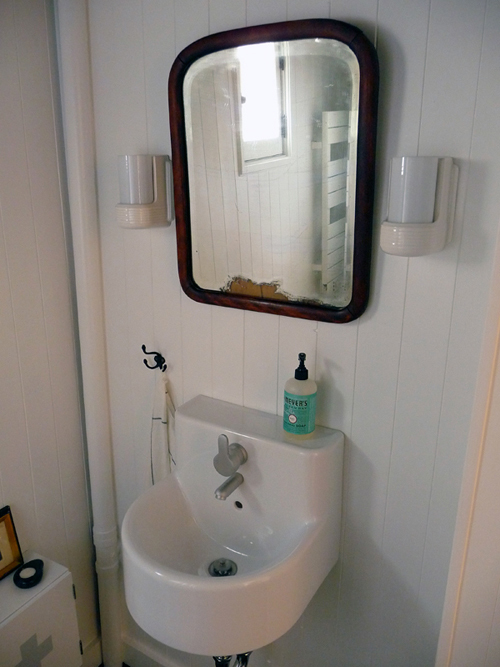 Save a search for "bathroom" in Collectables: Lights: Sconces and then just wait. There's the antiques category as well but I generally found it full of overpriced buy it nows. Have you been able to see Schoolhouse in person? If not, let me just say that their lights are SO beautiful and well made for the price, it is breathtaking. I have three fixtures in the house (circa 1906), two scones and a ceiling light, and they are a source of joy and wonderment almost everyday. If you want to see some additional close-ups of one of the scones (I have the one without stripes you linked to), let me know, those photos don't do it justice. And the way I look at investments of light fixtures is that they aren't just a rug or piece of furniture, but are part of the house, and the Schoolhouse are going to look good as long as the house is standing, and if you ever sell your house, something that will add value. Thanks for the votes of confidence in Schoolhouse, I've never bought from them but have heard only good things. I've just seen very few sconces styled like the Truman (where the body is shaped like a shelf holding a vertical shade in a votive sort of configuration) and wondered if there might be a name for that style. The price is not outrageously high, I agree, but the materials and manufacturing processes involved are not inherently expensive and if someone else has a similar style that costs $150 a pair rather than $280 I might be swayed, especially if I happen to like the styling more. Ok, just about settled on Trumans, but a little uncertain about the precise color of the base. This photo makes it look a little off-white or cream colored which I think would look wrong mounted on true white ceramic tile. nanook, it sounds like you have exactly the one I'm looking at, so if you could post some photos I'd much obliged.